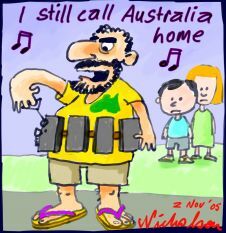 With more than 500 people packing the Social Science Lecture Theatre at the University of Western Australia on November 4, 2005, West Australians started working on the Anti-terrorism legislation proposed by the Howard government. This page is a web-page copy of the Anti-terrorism Legislation Action Kit distributed throughout the networks shortly after this Forum. The Kit is also downloadable from this page as a PDF File. 4 Nov 2005 Perth Forum: Rosemary Longhurst: Is Australia afraid? - We are concerned that this package of legislation conveys to the world that Australia is afraid - indicating to the terrorists that they are achieving their aim of generating terror and forcing governments into ever more punitive stances. NOTE: email addresses have been "disabled" by replacing the "@" with "(at)". If you use an email address, please correct this. Two weeks later he gained the support of the Labor state governments, all state premiers and chief ministers agreed in principle to laws which at that time they had not seen. The federal government cannot pass these laws without the support of the states. Mr Howard intended the laws to pass Parliament with little scrutiny and no public debate but the release of a draft of the laws by ACT Chief Minister Jon Stanhope has revealed the terrible scope of the proposal. Despite their initial statements to the contrary, the Prime Minister and Attorney-General now say the final draft will not be substantially changed from the version which was made public. The laws will attack human rights and undermine fundamental legal protections that ensure freedom from arbitrary detention and freedom of association, expression and movement. Some state premiers have expressed concern and a public debate has begun. However the Howard government still hopes to pass the laws quickly, possibly by November 10. The Bill was introduced into the House of Representatives on Tuesday 3 November and our elected representatives will not be given the chance to have a full and informed debate. It is no better in the Senate; where at the last session the Government foreclosed any proper scrutiny and debate by limiting the senate inquiry into the Bill to only one day. Since then however, they have bowed to the considerable expression of outrage from around the country, and allowed a longer Senate Inquiry which may last for up to two weeks. Our campaign is having an effect. All around Australia, legal experts, representatives from the Muslim community and civil rights advocates are condemning the introduction of this Bill. These laws are not necessary. The police and intelligence agencies already have extensive powers to arrest and prosecute those who seek to commit violent acts. These new laws are excessive. As history shows, ter-rorism has never been addressed by the creation of police state. It requires political and cul-tural solutions that address the root causes. The Anti-Terrorism Bill 2005 includes the following proposals to remove your rights. The laws rely on a broad definition of terrorism which would have included the African National Congress, East Timorese freedom fighters and protesters at refugee detention centres. Control orders allow a person to be put under house arrest, forced to wear an electronic tag and stopped from using phones or internet or communicating with certain people or groups of people. Breach of a control order carries a five year prison term. Each control order can last for up to a year, but a control order can be reissued again and again allowing someone to be indefinitely controlled. An individual judge can be asked by the Attorney General or Federal Police to issue a control order if it would substantially assist in preventing a terrorist act; or if the person provided training to, or received training from, a listed organisation. Constitutional lawyers are questioning whether this is a breach of the Australian Constitution as it may override the division of powers between the executive and the judiciary which is fundamental to the independence of our judicial system. The process for obtaining such an order does not have the protections of a criminal trial. It has a lower standard of proof and a person is treated as guilty until they can prove their in-nocence. A suspect is only able to challenge an order after they are subject to it. The laws are also retrospective, allowing people who may have had links to overseas groups many years ago to be subject to the orders. Under these laws, the police can get a preventative detention order to hold a person for up to 24 hours. This can then be extended to 48 hours and, if the state governments continue to back the laws, up to 14 days. Police must think there is a terrorist attack likely in the next 14 days, or there must have been a terrorist attack in the last 28 days. When detained, the detained person can talk to a lawyer, but only if the lawyer has been security cleared by ASIO. All their conversations are monitored by police. The detained person can call a family member to say they are OK but if they or their family member say any more they can go to prison for 5 years. Their family member can also be jailed for 5 years if they tell anyone else. In certain circumstances police can shoot to kill someone they are trying to take into detention. While a provision for the use of lethal force is already encoded in the Crimes Act, the 'shoot-to-kill' clause in the context of this Bill increases the risk of an accidental fatal shoot-ing of innocent people as in the case of in London, when Brazilian Jean Charles de Menezes was shot dead by police. If police believe a person "might have just committed, or might be about to commit a terror-ist act", under these laws they can stop and search that person, their vehicle and anything under their control. Police can also ask for name, address, proof of identity, and an explanation of activities. If the police find something they consider could be used as part of a terror-ist act, they can confiscate it. In addition, the Attorney General can declare an area (a building, a whole suburb or a whole state) to be a "security zone" for up to 28 days, on the grounds of "preventing a terrorist act occurring; or in responding to a terrorist act that has occurred." This allows police to exercise the same powers on any person in the area without a specific suspicion. There are a range of new provisions in the Bill which modernise the archaic laws of sedition as well as broadening the scope of terrorism offences. These laws threaten freedom of speech and expression and threaten to drive underground or simply silence legitimate public debate and dissenting views about a broad range of public issues. This might include debate and public protest about the war in Iraq and 'the war on terrorism'. The charge of sedition carries a maximum penalty of seven years in prison. Organisations which advocate views which dissent from the position of the Government could face charges of advocating terrorism and be banned. Membership of an organisation, including 'informal membership', designated as 'illegal' within the definition of these laws, carries a 10 year prison term. Similarly organisations which advocate changes to Australian law by unlawful means such civil disobedience could be declared unlawful associations. Potentially, unions, environmental organisations and others could be affected. Other measures give police and ASIO extensive powers to force a person to produce personal and private documents such as financial records and to find out about travel patterns. The current safeguards to protect individuals' rights in regard to phone-tapping by ASIO and mail monitoring have also been weakened. Under these new laws, ASIO can confiscate property permanently if an individual is subject to a warrant. Information courtesy of Australian Greens, National Office. CONCERNED ABOUT THE NEW ANTI-TERRORISM LEGISLATION? If you are concerned about these laws there are a number of things that you can do. Talk to friends, family, workmates, colleagues and acquaintances Discuss your concerns about the legislation with family friends, acquaintances and others. Explain to them the legislation and your concerns about the legislation and encourage them to find out for themselves. National day of protest to demand an end to the brutal occupation of Iraq and the attacks on our civil liberties at home. Guest speaker: Terry Hicks, father of Guantanamo Bay detainee, David Hicks. Ring, write letters, send a fax and email to the premier and your local state MPs to urge them to withdraw support from the laws. Make an appointment to meet them to explain your concerns. Contact Individual Members of Federal Parliament (both in the Lower House and in the Senate), expressing your concern about the proposed Anti-Terror legislation. Raise concerns about particular provisions within the proposed law, as well as about the way in which the Howard Government has managed to manipulate and curtail the political debate. Ring, write letters and send a fax and email to your federal members of parliament in the House of Representatives and the Senate urging them to insist that the Bill is subject to proper public and parliamentary scrutiny. Try to get the message across that you are concerned about the extremely short amount of time Federal Parliament has allowed for debate of the Government's proposed Anti-Terror Laws. And you could also say that you are very concerned about the way those laws are currently drafted. To find out who your Federal member of parliament is, go to the Australian Electoral Commission's website: To locate the electorate office of your local member, go to the Australian parliamentary website. Telephone your Federal member of parliament and arrange to meet them urgently. If you can't meet with your MP ask to speak with them over the phone. And failing that, ask to meet their most senior adviser. Organise a group of you to see the MP or their adviser, nominating one of you to act as spokesperson, and another to take notes. Why, contrary to the current law, are police to be allowed to detain people without intending to proceed with a terror-related charge or any charge? Why is it necessary to allow the detention of a person for up to 14 days, when that per-son has not been charged with a terror-related crime, or any other crime? Why does the legislation allow for the possibility that a person could be held under house arrest, for up to 12 months, when that person has not been charged with a terror-related crime, or any other crime? Why is it necessary that a judge act in a 'personal capacity' rather than as a judge, when the police ask them to extend a Preventative Detention Order? Ask the politician, or their adviser, whether they will be voting for or against a Bill or Bills that include provisions for Control Orders and Preventative Detention of people who have not been charged with a terror-related crime. Make it clear that you are deeply concerned with the way that these matters have been handled. That you disagree strongly with restricting Federal Parliament's ability to debate, amend and improve the legislation. Remind them that you vote. Locate the postal and email addresses of your MP and all the Senators from your State/Territory. Write to each of your representatives and ask them the questions you would have if you'd had a face-to-face meeting with them. Stress your concerns and remind them that you vote. At all times, remain courteous. Ask your questions and discus your concerns confidently and keep on asking questions if you're unclear or dissatisfied with any of their answers. The information here has been adapted from a variety of sources including New Matilda, and Office of Senator Bob Brown and the Australian Greens.